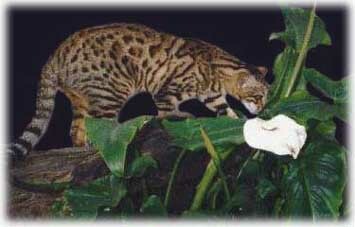 The Bengal has leopard markings as a result of the mix of a domestic cat with a Asian leopard cat. Long, muscular body with a round face. Medium, round-tipped and large ears; wide nose; and large, oval eyes. Its coat is very dense and silky. Little grooming is required. This is a very impressive cat. TEMPERAMENT: Intelligent, gentle, friendly and loyal. Active and talkative. Like the water. Great with children.